We are on the 5th episode of Sugar & Spice on DSTv’s Home Channel. I have been completely overwhelmed by the response and the emails and messages have been heart warming. Thanks to all of you for following the show and including some of my recipes in your cooking repertoire. I do cook a fair bit of Indian dishes everyday, whether at Holi Cow or for my family…we love traditional Indian food but that doesn’t mean it isn’t the only cuisine that I prepare. Italian, Middle Eastern and Moroccan recipes are some of my favourites but also Portuguese cuisine! Portuguese food and I don’t mean the Nando’s type peri peri chicken, is popular and the Lusitoland festival shows just how popular it is. On this season of Sugar & Spice, I have been stepping out of my curry zone and doing some of my other favourites with you…I challenged myself only allowing two Indian themed episodes. The team decided on Italian, Moroccan, Chocolate, Mediterranean, South East Asian and a whole episode dedicated to the love of chocolate! This week features a Portuguese influenced Brazilian Pork and Bean stew with orange and cocoa….yes, it does sound a bit like a dessert and not a common combination for the South African palate but believe me, it does work like a charm. The Mozambican Style Prawns cooked in a buttery juice with onions, garlic and stock….and a Saffron Apple Cake with home-made custard! We have the Portuguese to thank for making spices a part of global cuisine….and we also have them to thank for the Goan Indian Vindaloo….more about the Lamb Vindaloo later! 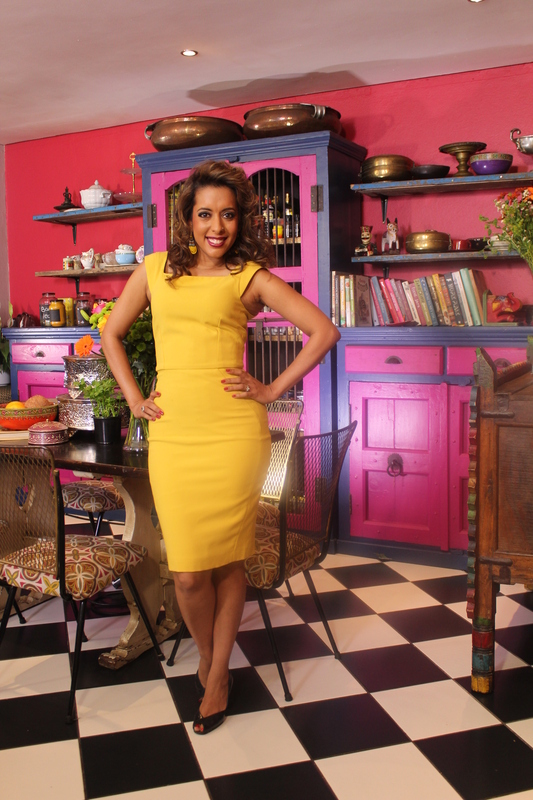 No matter what the theme is, the Home Channel together with Spar and AMC Cookware have given me an opportunity to share my love of all things spicy with you….it has been an amazing adventure so far and looking forward to the next season! 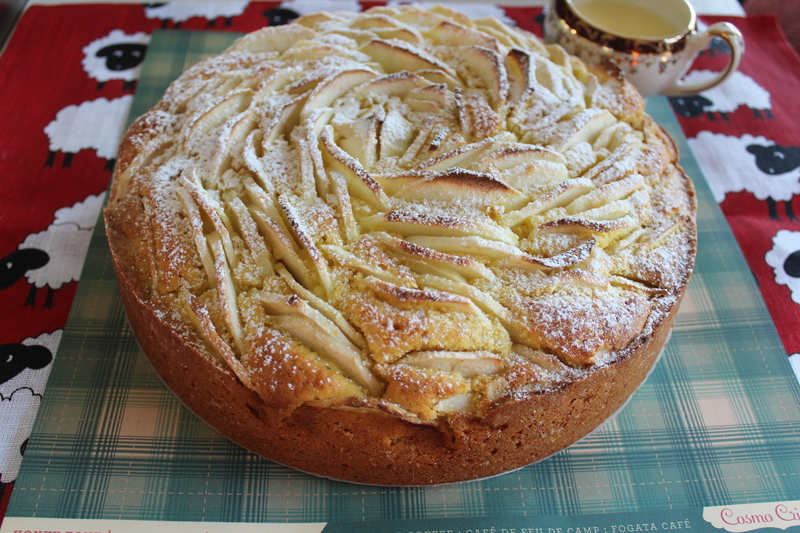 Here is the recipe for the Saffron Apple Cake…this is a beautiful fruity cake and the appearance makes it impressive. You can use mixed spice, cloves, and cardamom to flavour the batter but I stuck to the classic cinnamon. For more recipes from Sugar & Spice, log onto http://www.thehomechannel.co.za and click on the food show tab. 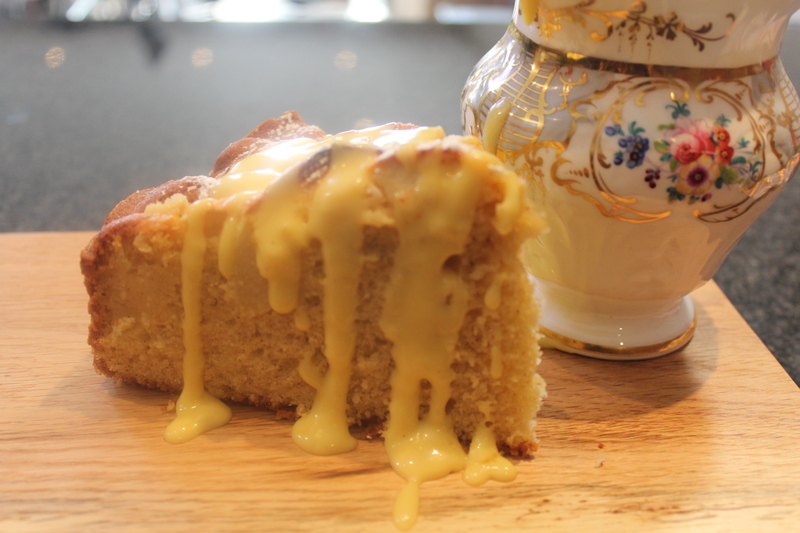 Ready to serve…Yudhika’s Saffron Apple Cake drizzled with home-made custard! Pre-heat oven to 170 degree celsius. Grease and line a 10 inch loose bottomed cake tin. Heat the saffron strands in a dry pan for 30 seconds or microwave for 10 seconds. Leave the saffron to cool and then crush lightly with your fingertips. Cut the apples in half and slice thinly. Lightly toss in the lemon juice to prevent the apples from discolouration. Beat the egg whites until foamy and gradually add 15ml of from the 225g of weighed sugar until stiff. Cream the butter until light in colour and gradually add the sugar. Continue beating until light and fluffy. Add the almond or coconut flour. Gradually add the flour alternating with milk. Add the baking powder, salt, cinnamon, crushed saffron and salt. Beat well until the batter is smooth. Lastly fold in half the stiffly beaten egg whites to ‘loosen’ the batter. Fold in the remaining egg whites. Pour the batter into the prepared tin and smooth with a spatula. Arrange the apples starting out at the centre and angling each piece working in an outward concentric pattern so its starts to look like a flower. Use the smaller pieces to fill in the gaps – do not press the apple slices deep into the pastry. The should have a raised appearance. Sprinkle 30ml sugar over the apples and bake in a pre-heated oven for 30 – 35 minutes or until the cake is golden brown and shrinks away from the side of the tin. Leave to cool slightly and dust with icing sugar. Serve with home made custard. Heat the cream with vanilla paste, stirring continuously to prevent it from scorching. Once the cream comes to the boil, place the egg yolks and sugar in a mixing bowl. Mix the egg yolks and sugar into a paste and pour the hot cream over – this is an important step, do not add the eggs into the hot cream as this will cause the eggs to scramble. Whisk the mixture and pour back into the pot. Place the pot back on low heat and whisk continuously until the custard thickens. Lay a piece of plastic wrap over the surface of the custard to prevent a skin from forming. Serve drizzled over the sliced saffron apple cake. The temperature in Jozi is dropping and there is a chill in the air. I think that this is the perfect weather for comfort food and here is the perfect recipe…a quick and easy flop proof creme brulee! Enjoy! The temperature in Jozi is dropping and there is a chill in the air. I think that this is the perfect weather for comfort food and here is the perfect recipe…a quick and easy flop proof creme brulee! Enjoy!.